Express Pass For Qantas Business Class Passengers! If you’re flying for 15 hours, you’ll probably want to make yourself comfortable. This is the journey from Los Angeles to Sydney in the Qantas 747 Business Class seats. It’s very difficult to find premium award space with Qantas, especially when trying to use AA miles. You’d think that’s because the seats are full, but nope! I was in a VERY empty business class. I was lucky enough to book the only 2 tickets I saw available with American Airlines for the Los Angeles to Sydney flight in Qantas Business Class. Each ticket cost 70k AA miles for the one-way flight. Considering how long the flight is, this was a pretty good deal. As soon as I had a confirmed ticket, I called up AA to get my Qantas record locator number, then called Qantas to reserve my seat. I didn’t know the flight was going to be empty, so I selected the two seats that has unrestricted aisle access. 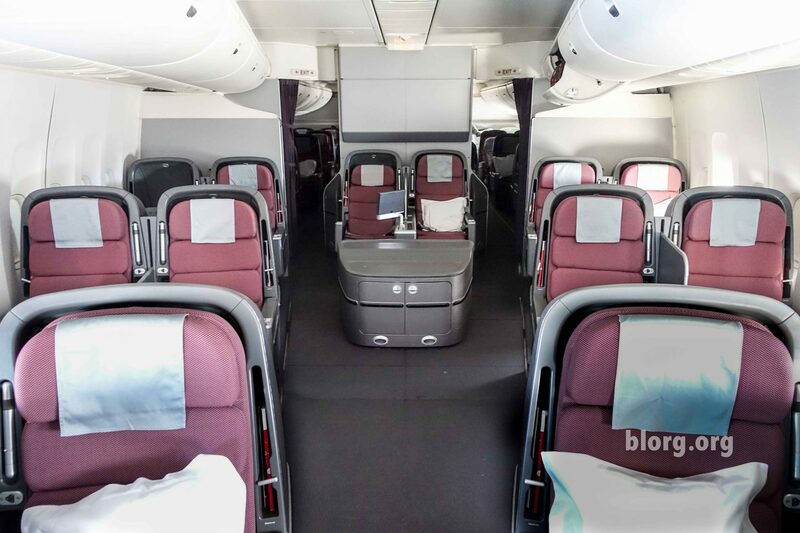 On the 747, the best business class seats are in the nose of the plane. As you can see, that’s a lot of space! There were a total of 6 people in business class on this flight. I assigned myself a seat in the forward cabin and had a very quiet flight. The seats were pretty comfortable. I set up another seat as a bed and one seat as an area to watch movies. The flight was 15 hours. I had plenty of time to watch movies. I watched Keanu (which was hilarious), Suicide Squad (very boring but I forced myself to finish it) and the X-Men Apocalypse (good enough). I spent some time between movies walking around the business cabin. I mostly walked around the areas that were unoccupied to not disturb the other 5 business class passengers. Pajamas are provided for business class passengers. Be sure to get comfortable and get in those pajamas as soon as you can. You’ll keep your own clothes fresh until you arrive at your destination. Lots of food and snacks were available for business class passengers. I didn’t care for the food too much since most of it didn’t sound appealing. I had a few talks with the cabin attendants about where to eat once I get to Sydney. After visiting the places they recommended, my tastes did not align with theirs. Included with the immigration form you fill out on the plane (required to enter Australia) you are also given a pass for the Express Immigration line. You get out of the airport pretty fast with this sweet perk. Since I travel with carry-on luggage only, I was out of the airport in minutes. The 747 I was on did not have a first class cabin. You’ll want to get on the Qantas A380 for their first class if that’s what you’re looking for. Check out The Champagne Mile’s on the Qantas A380 First Class experience to see what you’re missing.